After 21 years of operating as a grain and coal hauler on the Great Lakes, the 132-foot schooner Fleetwing and her owner, Captain Andrew McGraw, were experiencing hard times. Some say McGraw sold his old ship to the insurance company when he sailed it into the rocks of Garret Bay off the coast of Wisconsin on the stormy night of Sept. 26, 1888. He denied the story. But everybody knew that the Fleetwing was no longer profitable. 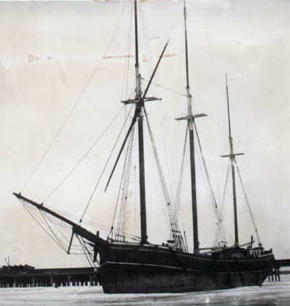 Instead of running long hauls of grain and coal up the lakes, the schooner was now carrying lumber from Saginaw Bay and other Michigan ports to Chicago, and often carrying no return cargo. In 1884 McGraw mortgaged his ship just to keep it operating. On her last voyage, the Fleetwing left Menominee, Michigan, with lumber bound for Chicago. McGraw and his crew sailed the vessel out on Green Bay toward the Death’s Door Passage. But they were met that night with a building northwest gale. As the bluffs of the Door Peninsula came into view, McGraw said he changed course for Table Bluff, a landmark to the passage entrance. But it was a dark and stormy night and McGraw said he mistook another bluff and drove his ship into the rocks of nearby Garret Bay. The ship struck at about 11 p.m. It was driven so hard aground that the crew members has little trouble swimming and wading ashore. Because of the storm, nothing was done to attempt to save the Fleetwing that night. By the next day, her stern was settled and she had nine feet of water in her hold. Salvage work was stopped by a second storm that broke the old wooden ship in two. By now it was declared a total wreck.